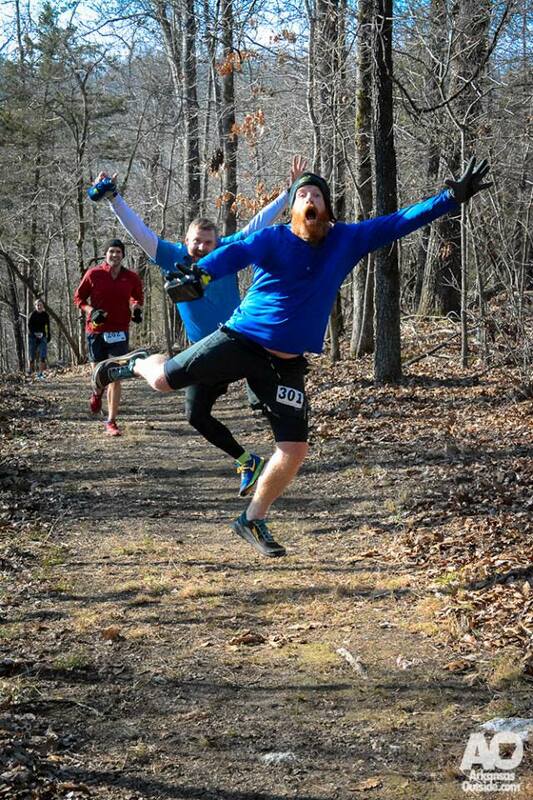 David's Trail Endurance Run offers a challenging course through the Ozarks along beautiful Norfork Lake. A great mix of single and double track takes you through 5000+ ft. in elevation change for the 25K and and even more for the 50K. Proceeds benefit trail expansion and K12 activities, spreading the word of loving the outdoors! This is a cupless event! Aid stations are stocked, but you will need your own handheld, reservoir, or purchase a HydraPak Speed Cup for yourself! Cupless Racing Sponsored by HydraPak! Friday Night Run! Cruise the trail (and stay on it!) with your headlamp as you navigate an 11K the night before you tackle the whole course! January in the Ozarks can mean sunny 45 degree weather or 10 and snowy. 2017 race day was sunny and reached about 70, 2019 was snowy and almost miserable! Race is held rain or shine, sleet or snow! Pack for anything, stay at Rocking Chair Resort, run the race, then hang out us afterward. Cash purses for setting the 50K course record (male & female), prizes, and post-race grub await you at the finish! Course runs through Robinson Point, Panther Bay, and Bidwell parks on David's Trail along Norfork Lake in Mountain Home, Arkansas. The weekend's host, Rocking Chair Resort, offers start/finish line lodging. On-site premises are single room cabins up to full houses available for rent! Resort lodging will sell out! Update: Rocking Chair Resort has sold out! Not to worry though, the next best place is the Lake Norfork Inn, just minutes from all the action. Lake Norfork Inn is offering DTER specials! ​Overall cutoff time of 9 hours (5:00 p.m.). All check point times assume an average pace of 16:40 minutes/mile. ​Runners not making it through check points at the noted time will be pulled from the course and escorted to the start/finish at Rocking Chair Resort. Mile 18.25 | 50K turn-around: 1:00 p.m.
Mile 26.25 | Panther Bay Pavilion: 3:30 p.m.
Mile 31.75 | Finish @ Rocking Chair Resort: 5:00 p.m.